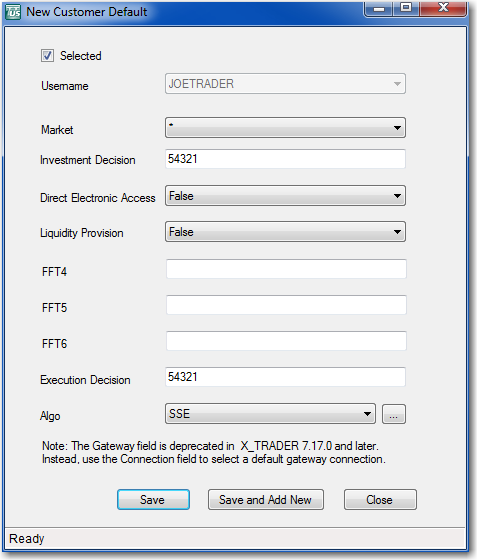 Administrators can create Customer Defaults for X_TRADER users and configure them so that end users cannot override their values. When creating Customer Defaults, the settings highlighted below can be configured to support MiFID II compliance. Descriptions of the MiFID II settings are provided in the following table. When setting these fields, refer to MiFID II Order Fields by Exchange. User or firm who made the trading decision. Enter a registered ID/Short Code. User or firm that submitted the order. Enter a registered ID/Short Code. Customer identification. Enter the customer's legal entity identifier (LEI/Short Code). Administrators can create Algo Defaults for X_TRADER users and configure them so that end users cannot override their values. Click Show Algo Settings at the bottom of the Customer Defaults window to show the Algo Defaults fields. Use these settings to assign MiFID II tags to both custom and TT Algos. When creating new Algo Defaults, the following options are available for supporting MiFID II compliance. The following table describes the algo settings options. 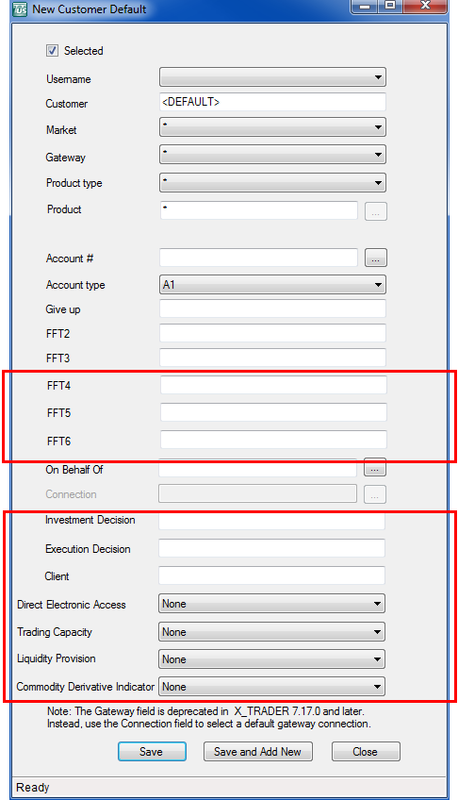 When setting these fields, refer to MiFID II Order Fields by Exchange. Sets whether the algo settings are selected by default in X_TRADER. The selected user's customer default algo settings. Sets which markets the user can trade with the selected algo. User or firm who made the trading decision. Free Text (up to 15 characters). In the TT User Setup control panel, click User Admin | Algo Types. In the Algo Types pane, click New... to enter the custom algo name and click Save.